For Century City, the station is proposed for Constellation Blvd - so the lawsuits from the BHUSD are a-comin'. For the Westwood/UCLA - the stop is proposed for Wilshire & Westwood. Final stop is the VA Hospital. Personally, I think Bundy is a much better choice for an interim terminal but that's just me. Why don't then put the last stop in DT Santa Monica? It would make sense to extend it to there. I think that's the goal of the Expo line. 1. Is there a Wilshire/Beverly stop? 2. Is this line even necessary with the Expo Line planned to go to West LA? Wilshire/Rodeo it looks like. Pretty much the same thing. The wilshire corridor is the main artery connecting east to west and is so congested I cant see any reason not to build this extension. That's even worse. Escalators coming out of the ground next to all those shops. At least Beverly Dr. is more ho-hum. It would have made more sense there. I can't believe that, in my life, I might see a subway going through Beverly Hills. It's mind boggling. Mind you, I don't care, but it is surreal. The entrance won't be located on Rodeo, it's currently planned to be on Wilshire and Reeves. The station will be called Wilshire/Rodeo for better visibility and recognition. Because Metro is being cheap. 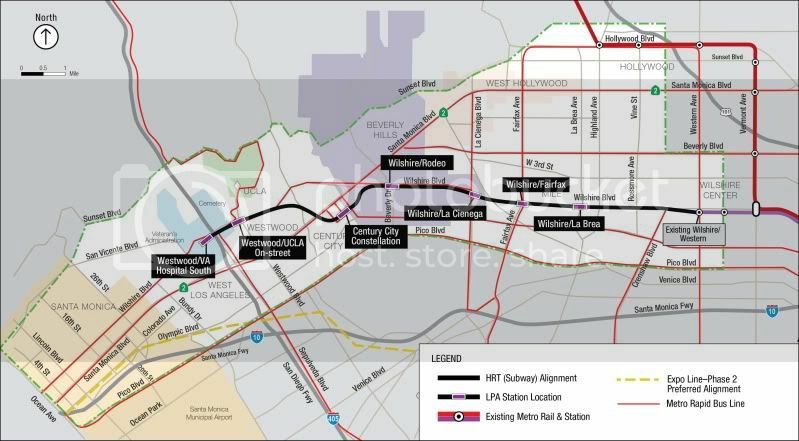 We also aren't getting the Pink Line through West Hollywood to connect the red line to the purple at Hollywood/Highland. That line makes so much sense it's ridiculous. WeHo actually wants it too!